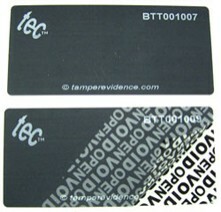 Voidtec (TT) is an easy to apply, self adhesive tamper evident security seal or void label. This security label is classed as 'total transfer'. On removal it delaminates to create a highly visible void message in the label substrate, whilst transferring the void message layer with adhesive to the application surface. 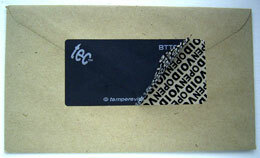 Total transfer of adhesive and void layer upon removal. Suitable for applications where void message is required to be transferred to application surface. Thermal transfer. preprinted with logo/text & sequential numbering. Custom labels - Black, Red, Blue, transparent.